Home > News > THE SONIC DAWN on tour! 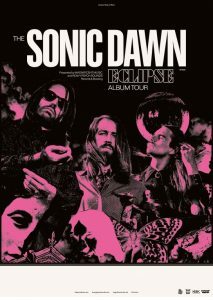 Danish psychedelic trio THE SONIC DAWN will commence a comprehensive European tour today in support of their third album Eclipse which is due on 01.02. via Heavy Psych Sounds! The Sonic Dawn is a band from Copenhagen, known for their eclectic psychedelic style and prolific touring of the European continent. “Denmark is entering the world market for psychedelic drugs,” Classic Rock Magazine concluded in a 2017 review, but here is a secret… The only ingredients needed to join this solar trip is the music and an open mind.